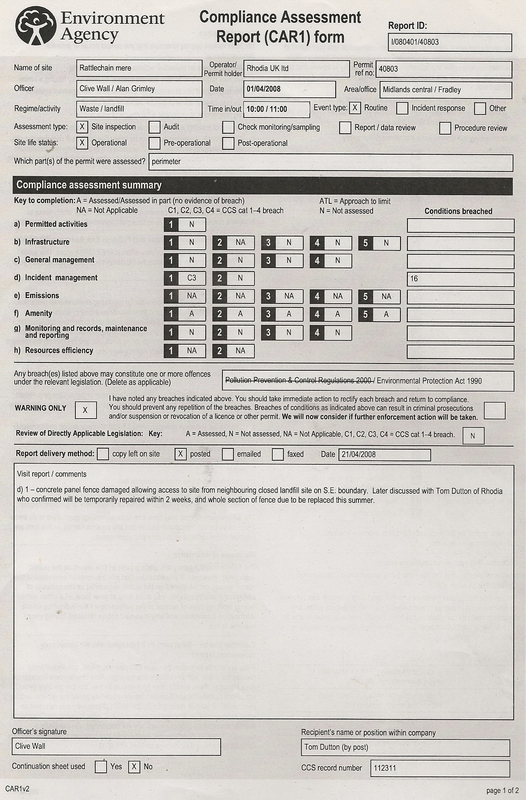 Under the Freedom of Information Act, The Environment Agency were asked by Swanwatch to confirm when Albright and Wilson and Rhodia had breached conditions of the sl31-licence , (laterly known as EA WML 40803), starting from 1996. This gives a fair ten year period from just before the start of their period of regulation, up to the point when waste was no longer tipped at the site, and encompasses the period when birds were first documented to be found dead or dying on the site. This would ensure that wastes were not above the water level, if this was the case the white phosphorus contained in this waste could ignite when drying out, given that it is a requirement to store it under water. Both companies certainly know this. As pumping by discharge consent is needed to be done to maintain the water levels, contamination of the “clean” smaller lagoon, whereby contaminated water could leave the site and become a potential source hazard should never happen. This is again in the interests of fire safety concerning potential white phosphorus spillages and is inextricably linked to conditions 8, 13, and 14. This again could be interpreted as not allowing the waste to encroach above the water levels, or the manner in which areas of waste have built up around the pipes. Or it could relate to the integrity of the pipes themselves. It puts onus on the tanker drivers competence, and the companies ability to maintain a “safe” site. Though the characteristics of White phosphorus themselves are not mentioned, and the toxic oxides that could be released, one can assume that this is what this condition is getting at when it states “no waste material shall be allowed to burn”. This is another basic requirement to keep out trespassers. Again to prevent trespassing or potential harm to the public, due to the nature of the waste. Condition “23. Within a period of one month from the date of issue of this license, a site identification board of durable material and finish shall be displayed at the site entrance giving the name of the site, the name, address and telephone number of the operator and of the Licencing Authority responsible for issuing the licence. It is important to note that of the 33 licence conditions, conditions 1-3 and 5 were not monitored by Environment Agency Inspectors during site visits, so could not be breached because they were not inspected during site visits. Conditions 15, and 27-30 relate to ceasing of tipping, and therefore were not relevant to be measured by the E.A during current tipping operations. Conditions 32-33 are essentially paperwork disclosures, not linked to the site inspections themselves. This therefore leaves 21 licence conditions which Albright and Wilson and RHODIA were in theory being monitored for to see if they were compliant with licence SL31. Thus they were only being measured on 21 licence conditions with the others being non-applicable to site visits, despite the first three conditions being probably the most important of all. 71 waste management licence inspection response forms between 1996-2006 were supplied to Swanwatch by the Environment Agency in relation to “when Albright and Wilson and Rhodia had been found to be breaching SL31 conditions.” This was up to the period when tipping is confirmed to no longer have taken place by Rhodia from 24th March 2006, This criteria was identified from the file of a reported 182 inspection reports by a single Environment Agency manager, namely Dave Whitford who would have gone through all the inspection reports during this period to look for these breaches. We have to take at face value that all of this information has been given to us, a requirement by Law, under The Freedom of Information Act. 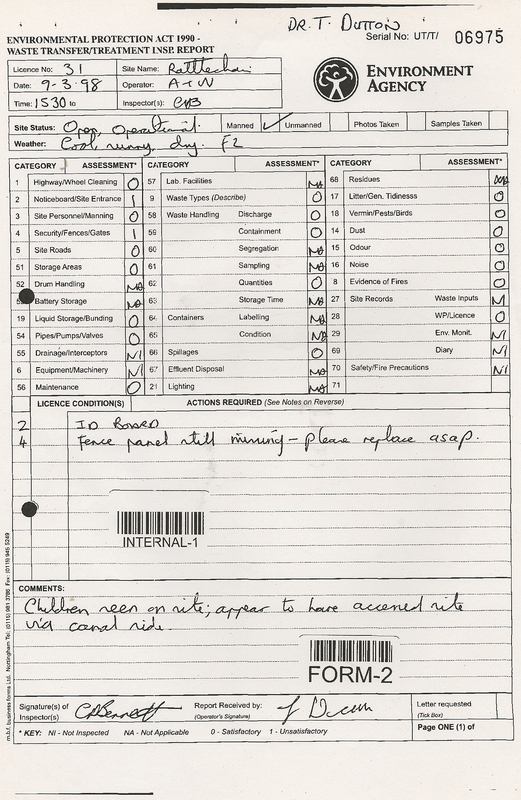 Analysis of how many times that Albright and Wilson and Rhodia breached their licence conditions during these inspections and what breaches took place have not all been recorded on these forms by the inspecting officers, but have been compiled by swanwatch for the purposes of this study based on the comments that they recorded on these forms and the licence conditions. We believe this analysis to be fare and accurate and representative of the manner in which these companies were “managing” this site during its last 10 years of receiving waste- the peroid when we first observed and publicly reported wildfowl mortality at the site. Our Interpretation of a licence breach may be contested by both The Environment Agency and Rhodia. 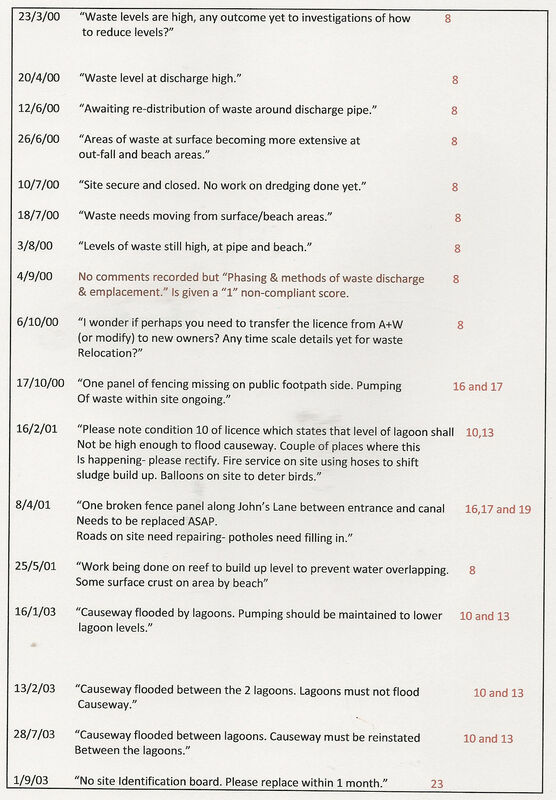 Words such as “compacted” in condition 8 could be interpreted in different ways, but based on the fact that the E.A observers recorded comments about the solid waste being above the water level- this surely relates to the solid material not being “compacted” to the satisfaction of the licensing authority- if it was to their satisfaction for waste to be above the water and therefore not “compacted”, then why did they instruct the company to remedy these occurrences, and record them on the inspection reports? Some reports state “NO ID BOARD” as being present on the site entrance. Condition 31 was essentially linked to condition 23 when it was issued but as both of these signs had to be displayed on the site entrance they count as two separate breaches. The “ID board” could imply one or both of these signs being missing. 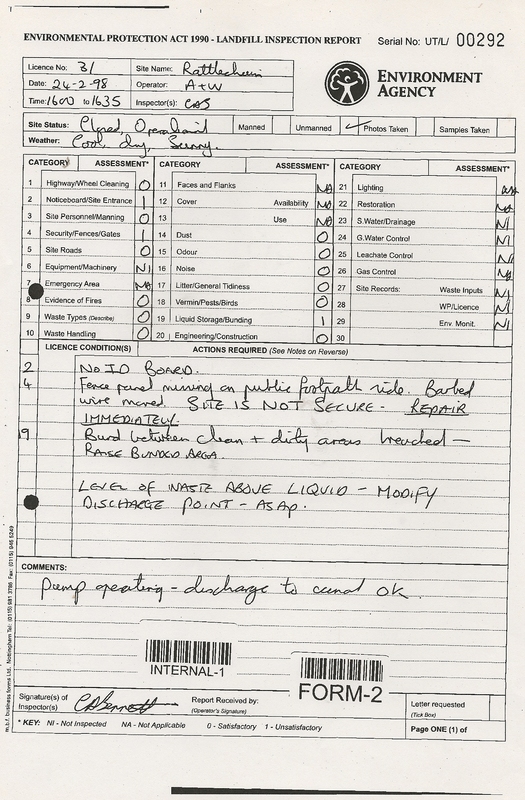 We have only counted “NO ID BOARD” to indicate a site ID, thus being a condition 23 breech, though it is certainly our observation that both signs have been missing at various times, thus also breaching condition 31. 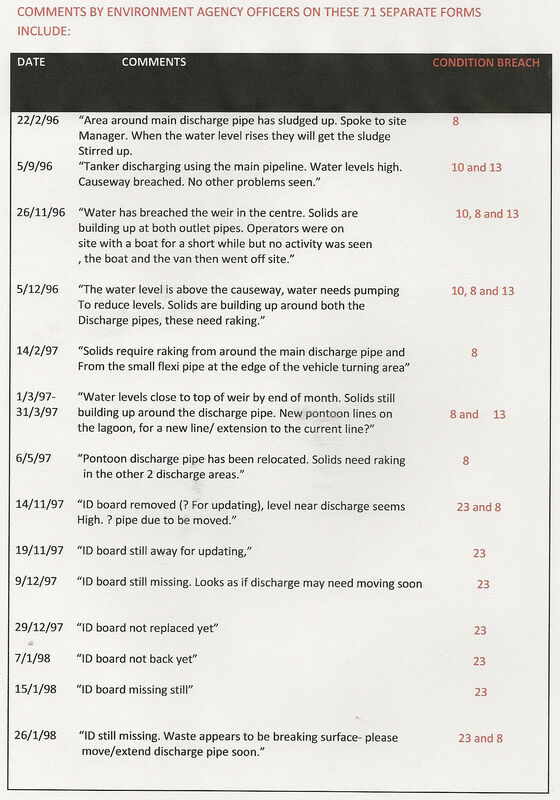 Condition 10 concerning the levels of the liquids not being allowed to rise above the causeway path also invokes condition 13 when breached since the lagoons were not being operated and maintained to ensure the liquids were being contained satisfactorily. There are therefore some single incidents which cover multiple linked breaches, but this is due to the poor wording of the original licence which should be noted was never remedied subsequently by subsequent regulators as it could have been. A footnote has to be added to the generation of these reports. The number of times that an inspector visited the site could skew the results of such analyisis. 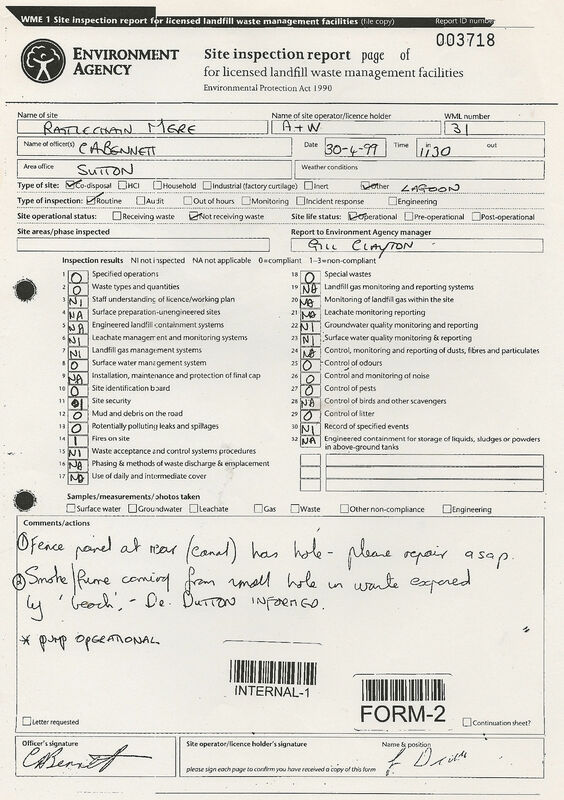 For example if an inspection was made to the Rattlechain site everyday (which certainly is not the case), the inspector may note that the same licence condition has been breached on each report form, day after day until he saw that it had been corrected and that there was no breach taking place. 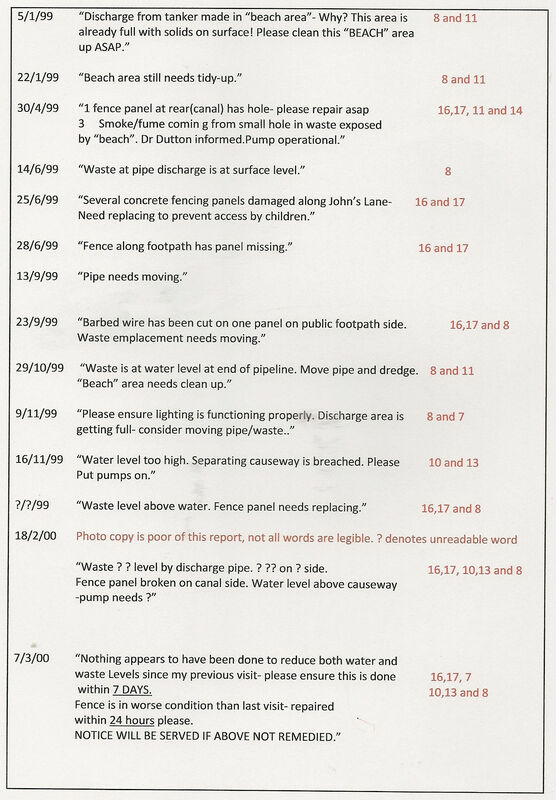 For example if “the waste levels were high” on 1st January and he made a subsequent visit on 2nd January noting the same occurrence, this would count as two separate breaches, given that two site inspection reports have been generated. Albright and Wilson and Rhodia may consider this to be unfair, but given that they have delayed in correcting the breach, they can have no arguments- when by law they should never have breached any conditions of the licence in the first place. From the previous table it is possible to conclude that for a 7 month period from November 1997-June 1998, the site ID board from the front gate was missing. Waste levels were unacceptably high on numerous occasions, the causeway path was regularly being breached and on one occasion a phosphorus fire was in progress breaching condition 14, which the tanker driver and Albright and Wilson were obviously not aware of. Site insecurity also had led to children accessing the site, and this was not “Repaired immediately”. 11 seperate licence breaches can be identified during this period. 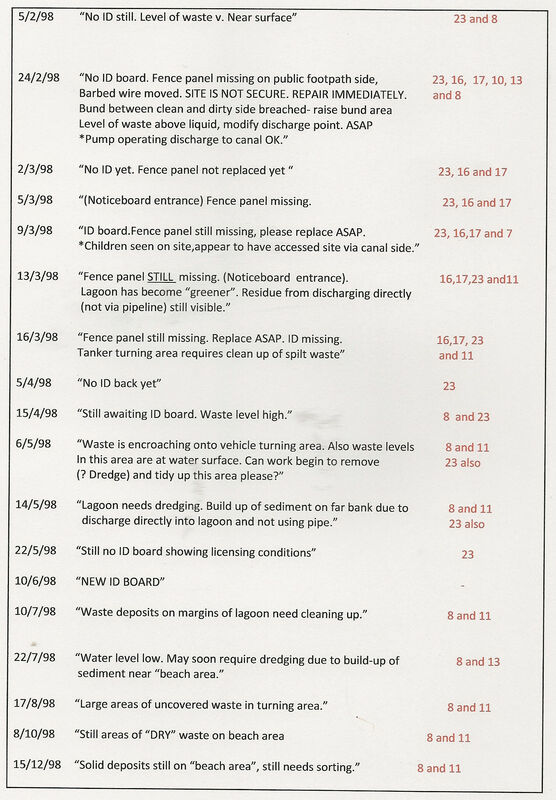 In addition to multiple breaches of conditions 7,8,10,11,13,16,17 and 23, condition 5 is identifiably breached, given that Rhodia had failed to disclose the level of waste dumped and also condition 19 when the road on site was unacceptably potholed. Altogether occasions when Albright and Wilson and Rhodia failed a licence condition add up to 137 breaches – a truly shameful record. 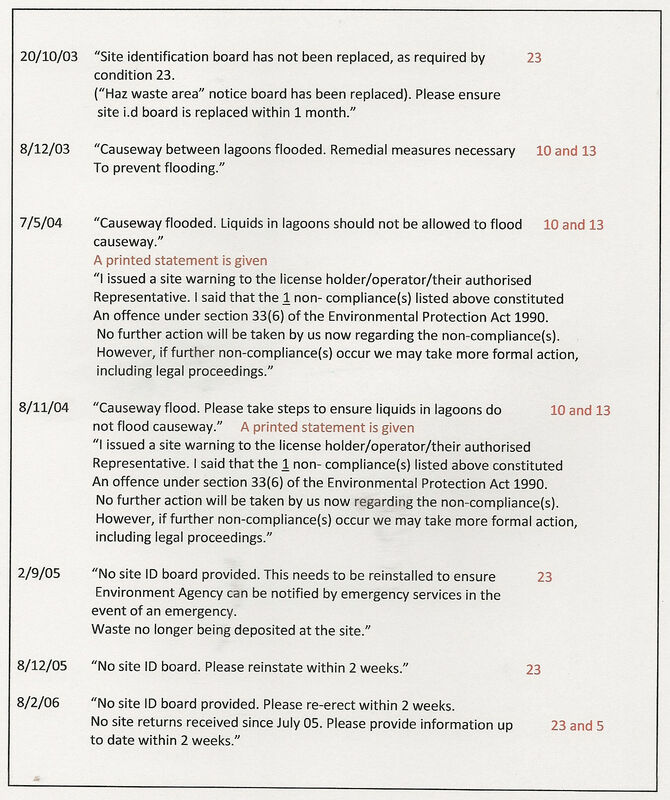 Even after the end of official waste depositing at the lagoon in March 2006, Rhodia continued to be in breach of the environmental permit known as EA WML 40803 that they were now operating under; (the SL31 LICENCE CONDITIONS STILL ALL IN FORCE). 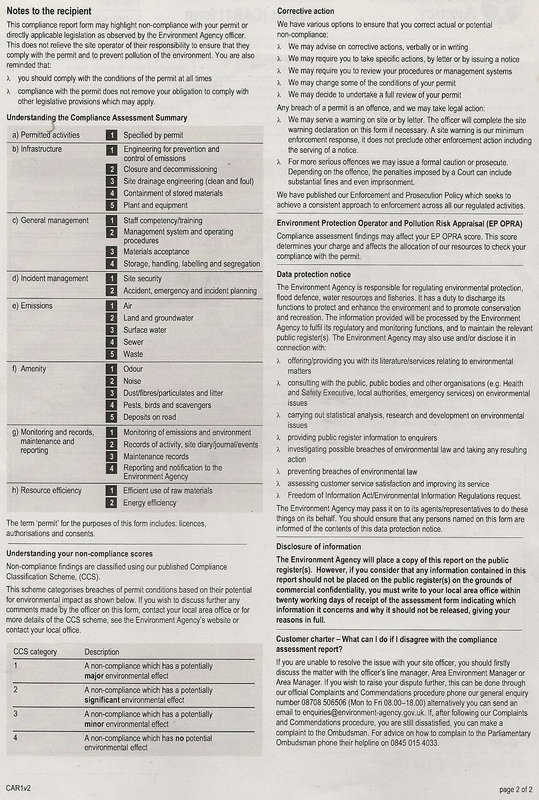 Site inspection forms were now renamed “Compliance Assessment Report (CAR 1) forms” and had a range of coded numbers which are explained below.